You voted and we listened. 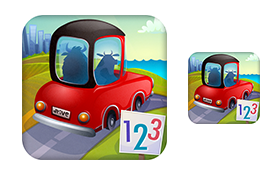 It is with great pleasure that I now introduce the winner of the Drive About: Number Neighborhood app icon challenge. You also told us we absolutely had to find a way to get some numbers into the art so we made some adjustments. We really like icon and we're grateful for your help. Today, we're making some last minute tweaks before shipping the game for beta testing. If all goes well, we'll release the app in about a month. You can sign up for our newsletter and we'll keep you informed as we get closer to launch.